ESPN’s riveting new documentary, O.J. : Made in America, has captivated audiences with its powerful—and revealing—story about one of the most polarizing figures in sports history. And like many other documentaries, it uses sports to tap into deeper questions about race and gender, media and celebrity, and even about politics and American identity. But sports documentaries can do more than just reflect our culture back to us. They can entertain and inspire us, and make us laugh or cheer. Here are 10 great sports documentaries that scratch deep beneath the surface. Although Olympia, Part II filmmaker Leni Riefenstahl has come under scrutiny for her involvement in the Nazi Party, there is no denying the visual power of her depiction of the athletes from the 1936 Olympics in Berlin. Riefenstahl pioneered dozens of motion picture techniques that have become staples of both cinematic storytelling and sports coverage. Her use of editing during the diving montage is utterly breathtaking, capturing the agility and grace of the athletes from almost every angle imaginable. It’s the ultimate fantasy: Director Bruce Brown followed a group of young surfers as they traveled the world looking for the “perfect wave.” Brown’s cinematography helped to romanticize surfer culture and to introduce the sport to millions of viewers. The Endless Summer famously followed its subjects along the west coast of Africa and the Indian and Atlantic Oceans, before settling in Durban, South Africa, where they find what they are looking for: four-foot waves that could carry them for 15 minutes at a time. It’s a film that captures not just the joy of surfing, but the beauty of it as well. The subject of hundreds of gender studies theses, Pumping Iron depicts the Mr. Universe and Mr. Olympia bodybuilding competitions from the 1970s. The film helped launch Arnold Schwarzenegger as a national celebrity, while also portraying him as shallow and self-absorbed. 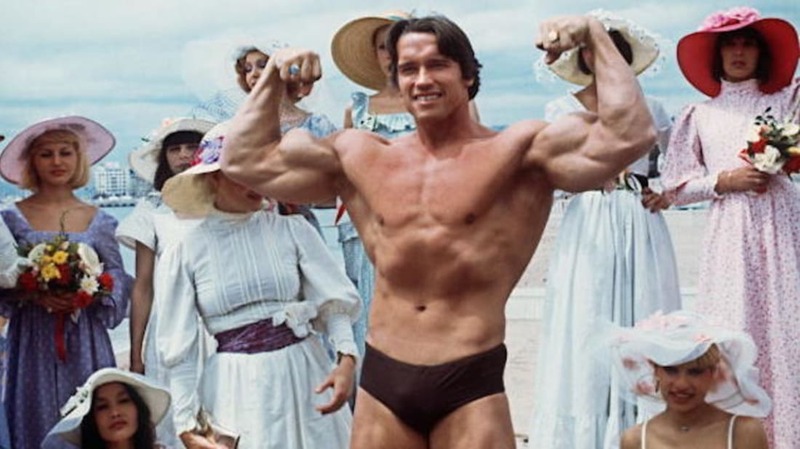 Throughout the film, Schwarzenegger blissfully describes “the pump”—the rush of blood into the muscles during a workout—as a form of sexual pleasure and candidly admits to deceiving his opponents. Roger Ebert once called Hoop Dreams the best film of the 1990s. Following two teenage basketball stars, Arthur Agee and William Gates, throughout their high school careers, Hoop Dreams captures the raw emotions of competing on the court and struggling to survive in inner city Chicago. Though both players have their share of successes and setbacks while playing basketball, many of the film’s most touching moments take place off the court, including one profound moment of triumph for Agee’s mother as she achieves her own modest form of success. Hoop Dreams also offers a trenchant critique of the sports recruiting industry through a powerful cameo by filmmaker Spike Lee. Ken Burns’s sweeping, nine-part series documents the history of baseball from its rugged origins to the home run-obsessed (and steroid-inflated) 1990s. Burns provides much more than a nostalgic portrait of a pastoral sport. Instead he demonstrates baseball’s importance to the Civil Rights movement and an extended discussion of Curt Flood’s courageous battle against Major League Baseball’s unethical labor policies that prevented players from negotiating with multiple teams, which paved the way for the modern free agency system. Leon Gast’s energetic documentary portrays one of the most famous heavyweight bouts of all time, the “Rumble in the Jungle,” featuring Muhammad Ali and George Foreman. Gast captures Ali as a youthful and charismatic underdog during the peak years of the Black Power movement in both the U.S. and Africa. Interviews with public figures ranging from Spike Lee and James Brown to George Plimpton and Norman Mailer weigh in on everything from Ali’s cultural significance to his skill as a poet. But the real strength of When We Were Kings is the archival footage of Ali walking the streets of Kinshasa while adoring fans chant, “Ali, bomaye” (kill him), while a petulant Foreman mopes off in the distance. Filmmaker Stacy Peralta uses archival footage and contemporary interviews to portray the birth of the punk/skater subculture in the 1970s. Peralta, along with the rest of the Zephyr team, brought surfing moves to skateboarding and helped to develop new moves that differed radically from other skateboarders during that era. One of the most fascinating tidbits from the film: the Z-Boys pioneered their flashy aerial techniques during a drought in the mid-1970s, when they developed their moves in empty swimming pools. Added bonus: The documentary is narrated by Oscar-winning actor Sean Penn. Touching the Void is a dramatic retelling of Simon Yates and Joe Simpson’s efforts to climb Siula Grande in Peru. After reaching the summit, Simpson slipped and broke his leg, and when Yates attempted to lower Simpson into a crevasse, he inadvertently lowered him off a cliff, making it impossible for them to communicate and forcing Yates to make the difficult decision to leave his friend behind. Miraculously, both men managed to survive the ordeal and even went back to the original location to reenact some of the documentary’s key scenes. Touching the Void, with its liberal use of reenactments, pushes the boundaries of documentary filmmaking, while also offering viewers a thrilling story of survival. Murderball is an engaging documentary that introduces audiences to a relatively unknown sport, “quad rugby,” a modified form of rugby in which all of the participants are quadriplegics. The action cinematography of the film is captivating, depicting the violent collisions and quick movements that characterize the sport with cinematography that puts the viewer at eye-level with the players. Like Pumping Iron, Murderball serves as an exploration of codes of masculinity and how they intersect with definitions of disability. It’s a fascinating, heartfelt, and fun little film. 10. ONCE IN A LIFETIME: THE EXTRAORDINARY STORY OF THE NEW YORK COSMOS (2006). While soccer has steadily risen in popularity here in the United States, many fans will have forgotten the old New York Cosmos team, from the original North American Soccer League (NASL), and their captivating stars, Pele and Giorgio Chinaglia. Many of the team’s players were fixtures in the city’s nightlife—frequenting clubs like Studio 54—and the documentary captures how Cosmos matches were festive events that featured everything from cheerleaders to Bugs Bunny mascots. Once in a Lifetime also helps to contextualize the role of the old NASL in popularizing youth soccer programs in the U.S., paving the way for the sport’s current popularity.